What will you use to clean my home and how can I be sure there will be no cross contamination from my bathroom to my kitchen or worse from another house? At Signature Cleaning Services we feel that the best way to ensure our customers get the very best is to provide our teams with the highest quality supplies and this includes our microfiber cloths. We have chosen a microfiber cloth that is used in hospitals across North America. They cost more, but we feel our customers and our teams are worth it, and the results speak for themselves. It’s just another way we strive to be the best and deliver the best. 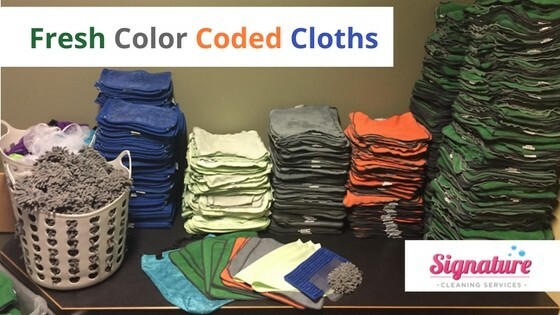 We send a fresh color coded set of cloths into every customer’s home. They are prepared in our office and laundered every day in our Steam Washer. They’re color coded for task, so that a bathroom cloth NEVER hits your kitchen. Thanks for reading our little brag bit.